What is National Anti-Profiteering Authority (NAA)? 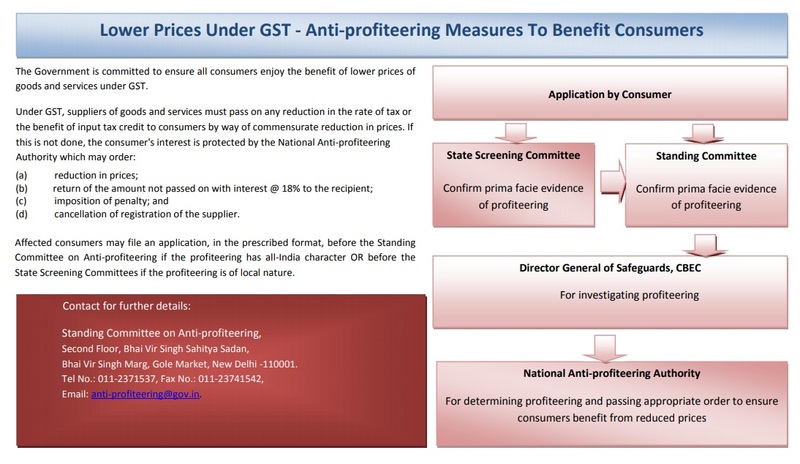 The National Anti-profiteering Authority (NAA) has been constituted under section 171 of the CGST Act read with Chapter XV of the CGST Rules to check and determine whether the reduction in GST rates or benefit of input tax credit is being passed on to the recipient by way of commensurate reduction in sale prices. Who can file complaint under Anti-Profiteering Rules? Any consumer or recipient affected or aggrieved by the supplier for not passing the benefit of GST reduction, may file compalaint to NAA in Form APAF-1. How can a consumer / applicant file complaint to NAA? The consumer or applicant may file complaint to NAA in the Form APAF-1. Download Form APAF-1 in excel. Download Form APAF-1 in PDF. Contact details of National Anti-profiteering Authority (NAA). NAA helpline number is 011-21400643. Rule 122 - Constitution of the Authority. Rule 123 - Constitution of the Standing Committee and Screening Committees. Rule 124 - Appointment, salary, allowances and other terms and conditions of service of the Chairman and Members of the Authority. Rule 125 - Secretary to the Authority. Rule 126 - Power to determine the methodology and procedure. Rule 127 - Duties of the Authority. Rule 128 - Examination of application by the Standing Committee and Screening Committee. Rule 129 - Initiation and conduct of proceedings. Rule 130 - Confidentiality of information. Rule 131 - Cooperation with other agencies or statutory authorities. Rule 132 - Power to summon persons to give evidence and produce documents. Rule 133 - Order of the Authority. Rule 134 - Decision to be taken by the majority. Rule 135 - Compliance by the registered person. Rule 136 - Monitoring of the order. Rule 137 - Tenure of Authority. NAA Orders in the matter of Anti-Profiteering.